 They built a house  A house was built  Our uncle takes Susan to hospital  Susan is taken to hospital by our uncle  We have cleaned the car  The. 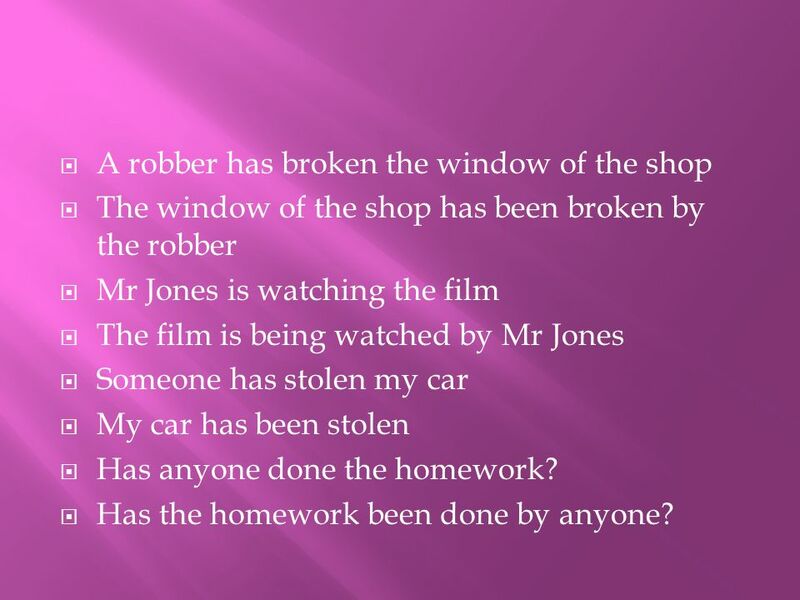 3  A robber has broken the window of the shop  The window of the shop has been broken by the robber  Mr Jones is watching the film  The film is being watched by Mr Jones  Someone has stolen my car  My car has been stolen  Has anyone done the homework?  Has the homework been done by anyone? 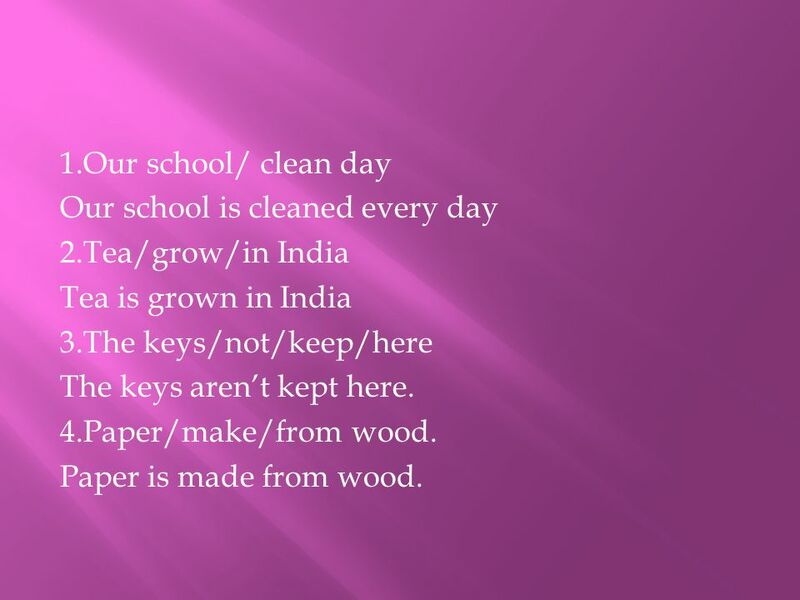 4 1.Our school/ clean day Our school is cleaned every day 2.Tea/grow/in India Tea is grown in India 3.The keys/not/keep/here The keys aren’t kept here. 4.Paper/make/from wood. Paper is made from wood. Download ppt " They built a house  A house was built  Our uncle takes Susan to hospital  Susan is taken to hospital by our uncle  We have cleaned the car  The." I found them smashed. I had them swept clean. I got it repaired. I had them looked after by a friend. Whats the Word? 1.You eat this in the morning. b_ _ _ _ _ _ _ _ 2.This tells you the time.c _ _ _ _ 3.People live in these. h _ _ _ _ _ 4.Nurses wear this.u. 5 A Period 2 of L9. Youre invited Youre invited New national flag is chosen New national flag is chosen be + the past participles ( ) The same between. What is the main interest of the text? Dr. John Pemberton? Asa Griggs Candler? Coca-Cola? Is it sold in 200 countries? Do we know who sells Coca-Cola? TO HAVE SOMETHING DONE. When we talk about arranging for things to be done by other people, we use the structure to have something done: * I am going. My mother cooks dinner every night. Dinner is cooked by my mother every night. 2ºE Fran Santos Fco. Javier Palero THE PASSIVE VOICE. Passive Voice. Form: to be + past participle (-ed, 3.stĺpec) It’s used when the focus is on the action It’s not important who or what is performing the. Answer all the questions with full sentences 1)Who was Mona Lisa painted by? ( Leonardo da Vinci) 2)Where is cotton grown? (In India) 3)When was Taj Mahal. 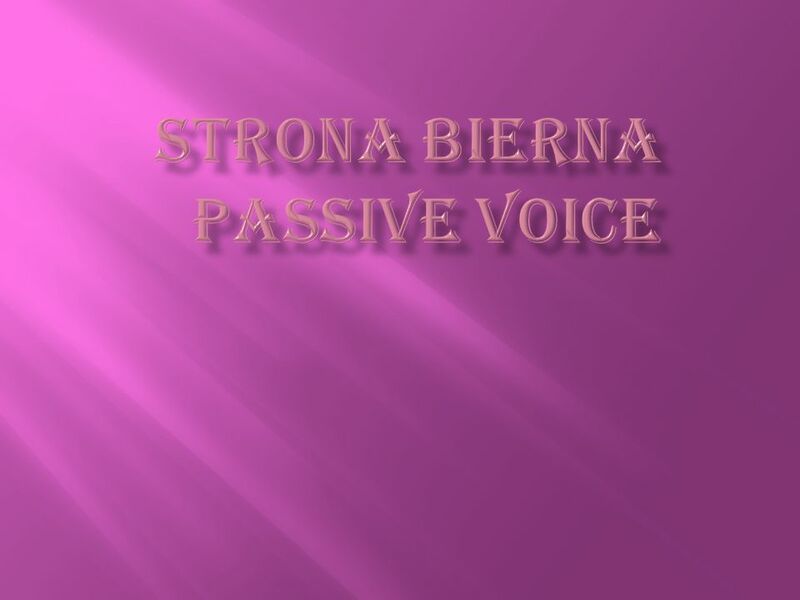 ACTIVE VOICE We se ACTIVE VOICE when our main concern is who does the action. My father cleans the house The boys played in the park Da Vinci painted the. I was doing my homework. I was playing my flute. I was making a phone call. I was watching around. I was repairing my car. I was working in my office. I have begun to homework. To begin. Begun.. We have broken the piñata. To break Broken.